“To explore strange new worlds. To seek out new life and new civilisations. To boldly go where no one has gone before!” These famous opening lines from the iconic television series Star Trek outline one of the central themes of the show: exploration, or travel into the unknown in search of new knowledge. The mission of the Starship Enterprise is one of the most famous examples of an important theme found across science fiction works – travel. These tales of travel enable us to encounter new things – new places, new life forms, new ways of thinking and doing things – and to stretch the limits of our imagination. The definition of science fiction as a genre is much debated but some of the very oldest surviving pieces of literature have science fictional elements within them, and a great many of these involve travel. The history of literature is filled with tales of fantastical voyages and outlandish modes of transportation. These include the 5th century BCE Indian epic poem Ramayana, which tells of machines that can travel to space or under water and which can destroy whole cities; and the 2nd century AD satire True History by the Syrian writer Lucian, which contains tales of travel to space and encounters with aliens. During the Middle Ages, some European and Arabic works contained science fiction-like transport devices, such as metal horses which could travel at great speed around the world or into space. With the Enlightenment in the 17th and 18th centuries, there came a variety of works that we might more easily recognize as ‘science fiction’, including many whose plots revolved around voyages to the moon and stars, including Kepler’s Somnium (1634) and Voltaire’s Micromégas (1752). And in the 19th century some of the most famous classic science fiction works, such as Verne’s Journey to the Centre of the Earth and H. G. Well’s The Time Machine, again had travel – through space and through time – as a central narrative theme. In the twentieth century tales of science fictional travel expanded into new media: magazines, cinema, radio and television shows and, later, computer games. Some of the earliest works within film and television centred around space travel, including the influential silent picture Le Voyage dans la Lune (1902) and the popular US space adventure TV series Captain Video (1949-55). Science fiction films and TV shows have proven enormously popular: According to the IMDb, three of the top seven most watched films of all time are within the science fiction genre (ET, Star Wars and Terminator) and Star Trek and Dr Who are two of the most popular and long-running TV series. As with more ancient tales, these film and TV works have travel as a central theme: we see the Terminator travelling through time to fulfill his assassination mission; ET searching for a way to travel back home across the galaxy; and Dr Who travelling through both space and time in his/her police box. The modes of transport taken on these science fiction journeys are nearly as varied as the tales themselves. 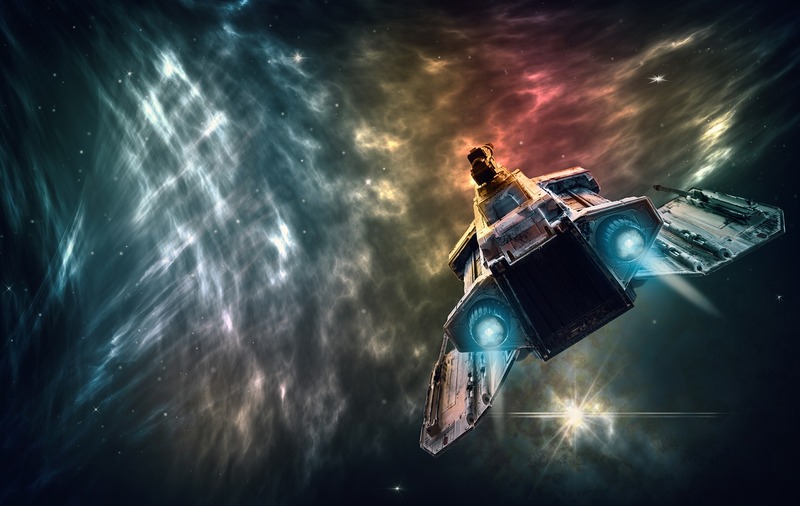 Older literature featured flying machines, metal horses and undersea glass orbs; more modern works make use of interstellar space ships, travel at light speed, transporter machines and time travel devices. Works such as Aurora by Kim Stanley Robinson (2015), feature the idea of ‘generation star ships’ which travel so far that the journey will take more than one human lifetime to complete, meaning that generations will live out their lives travelling across space. In other works, such as Arthur C. Clark’s The Songs of Distant Earth (1986), the difficulties of long journeys are handled by placing the ship’s crew into suspended animation – the ultimate way of cocooning the traveller from the travel experience. The motivations for these many science fiction voyages have often been, as with the Starship Enterprise, exploration for the sake of curiosity, to encounter the new and unknown. But as with real human travel, science fiction travels have had many different motivations, including trade and commerce, exploitation of space resources, diplomacy and warmongering. A common theme is that of the colonization of new worlds, sometimes driven by an expansionist desire, but often a result of the need to escape Earth and to find safety and comfort elsewhere. Some people have suggested that this popular science fiction plot should be considered as a real solution to the many environmental problems we are facing on Earth today: to this end a group of some 200,000 people have signed up to become citizens of Asgardia, which they claim to be the first ‘space nation’, with plans for Asgardian colonies to be created in Earth’s orbit within the next 25 years. The stories of imagined travel that appear throughout science fiction works can help illuminate the varied motivations for the real journeys we make here on Earth. Our works of imagination, of art and literature, are therefore one important focus of study for the Independent Transport Commission’s Why Travel? project, which aims to better understand human travel motivations. The project examines psychological and biological drivers of travel as well as the economic, cultural and social structures we have created that all enable, control and shape our travel behaviour. Ultimately, this deeper understanding will help us to make better decisions in future regarding human travel and transport, and the myriad areas of life which travel influences. For more information on the project, including news and expert views, see www.whytravel.org. The wording of the original 1960s show was updated in the 1990s Star Trek: The Next Generation from “no man” to “no one”. Some scholars and science fiction fans even cite the oldest surviving piece of literature, The Epic of Gilgamesh, as being the first work of science fiction (e.g. del Rey, Lester (1980), The World of Science Fiction, 1926-1976: the History of a Subculture. Garland Pub. p. 12.) The epic certainly has travel as a central theme, with much of the tale taken up with Gilgamesh’s long journey to find the secret of eternal life. Such metal horses can be found in the 8th-10th century One Thousand and One Nights and in Chaucer’s The Squire’s Tale (14th century).